St. Martin's Griffin, 9781250093813, 400pp. When Tom Orange rescues a mysterious young woman from a flooded river, he senses that their fates will deeply intertwine. At first, she claims to remember nothing, and rumor animates Root-an isolated settlement deep in a strange wilderness. Benjamin Knox, the town doctor, attends to her recovery and learns her name is Molly. As the town inspects its young visitor, she encounters a world teeming with wonders and oddities. She also hears of the Maimers, masked thieves who terrorize the surrounding woods. As dark forces encircle the town, the truth of Molly's past spills into the present. A desperate voyage. A genius brother. A tragedy she hasn't fully escaped. Molly and Tom must then decide between surviving apart or risking everything together. 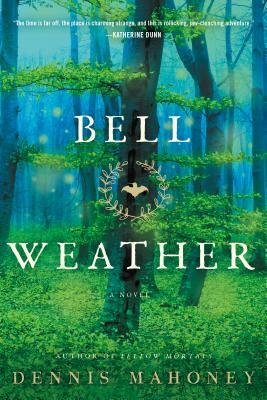 Dennis Mahoney's Bell Weather is an otherworldly and kinetic story that blends history, fantasy, mystery, and adventure, to mesmerizing effect.